Nutritional disorder – boron (B) toxicity. Boron (B) is an essential element that frequently exhibits deficiency symptoms if it is in limited supply. Growers often apply additional boron to avoid deficiencies, but if too much boron is applied, there is the risk of boron toxicity symptoms developing. Boron toxicities initially appear on the lower, older leaves. (This is in contrast to the symptomology occurring on the youngest leaves if boron is limited.) 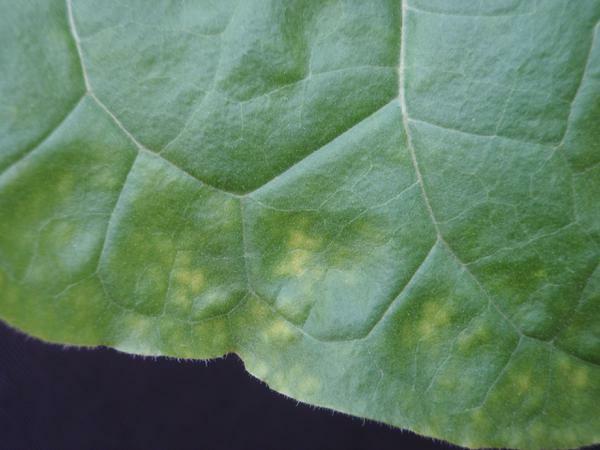 Early symptoms of boron toxicity will appear as wrinkling of the lower leaves (Figure 1) and interveinal chlorosis along the leaf margin (Figure 2 and Figure 3). The wrinkling is most likely caused by the lack of cell expansion when toxic levels of boron are present. This wrinkling will develop across the leaf’s surface resulting in leaf deformation. Over time the interveinal chlorosis will move inward and develop over most of the leaf. Cells will rapidly die when excess boron is supplied, resulting in necrotic spotting. With advanced symptomology, chlorosis and necrosis will progress up the plant to other leaves. 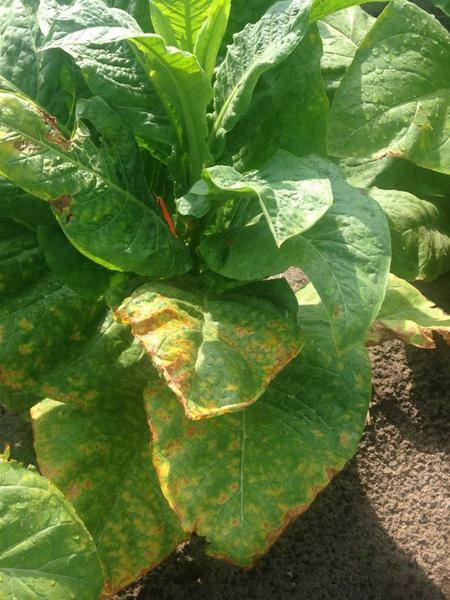 Figure 4 is a photo of boron toxicity from a tobacco field. Advanced symptoms can be viewed in Figure 5. Figure 1. Initial B toxicity, note the crater like appearance of the leaf’s surface, and the marginal wrinkling. Figure 2. Intermediate B toxicity will manifest as interveinal chlorosis along the leaf margin. Also note the yellowing of the depressed areas of the leaf. Figure 3. An additional view of intermediate symptomology of a B toxicity. Figure 4. Boron toxicity symptoms in the field. Figure 5. Advanced B toxicity. Leaf necrosis symptoms also occur on the older leaves with a potassium (K) deficiency. Potassium deficient plants also have leaves with a downward orientation. Typically, excess boron levels are the result of excessive applications of boron containing fertilizers. Submit a tissue sample for nutrient analysis. The sufficiency range for boron in tobacco is between 18 and 75 ppm for burley tobacco. A slight refinement of the range is available for flue cured tobacco, with 18 to 75 ppm boron being recommended from planting until maturity, and a lower range of 18 to 30 ppm recommended at harvest. Values above 75 ppm would be considered excessive. Leaf symptomology developed when B levels were in excess of 75 ppm boron. In the short term, it is difficult to correct excess levels. Damage to the plants cannot be reversed. However, boron is mobile within the soil and it is likely that some of the nutrient can be leached form the rooting zone with high quantities of irrigation. Growers should be aware that irrigation events designed to promote boron leaching are likely to remove other nutrients (N, K, S, and Mg) as well. Avoid boron applications the following season. Ensure that your calcium levels are adequate, which may help moderate the effects of the excess boron. Deficiencies of boron (B) have been documented in North Carolina. There are a number of factors, such as rainfall, soil type, and choice of fertilizer program, that likely contribute to deficiency. Producers should be aware that the range of boron deficiency and toxicity is very narrow and that the deficiency should be confirmed prior to boron application. Research has demonstrated a positive response in plants receiving 0.5 pounds of elemental B per acre in a foliar application of the nutrient. Alternatively, boron toxicity has occurred when foliar application rates are increased to 1.0 pound of elemental boron per acre. Producers should contact their local Extension agent if a suspected deficiency is observed and exercise extreme caution when making supplemental applications. There is no reliable soil test to accurately gauge boron availability; therefore, recommendations are based upon plant need rather than nutrient availability. Trace amounts of B are typically included in common N-P-K fertilizer sources used by tobacco producers. When recommended rates of these materials are applied, boron application will be no more than 1.0 to 1.5 lbs B/acre which is sufficient for tobacco growth. To prevent toxicity, producers are cautioned against applying additional B unless a deficiency is confirmed through tissue analysis. Boron toxicity has been identified at application rates as low as 0.9 lbs boron/acre when boron fertilizer is applied through a foliar application. If a deficiency is confirmed, producers should be very conservative with corrective applications. 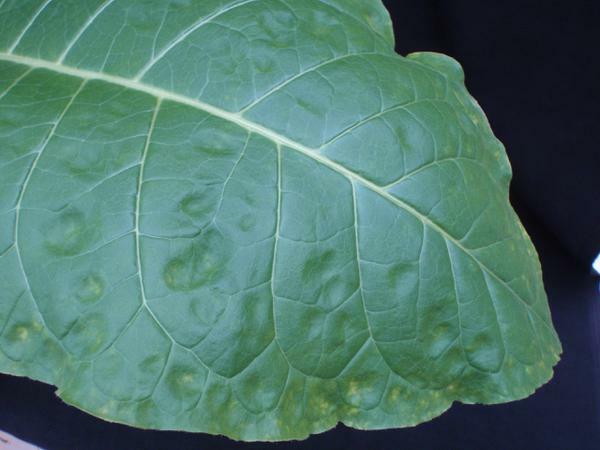 Additional information regarding corrective applications can be found in Tobacco - Boron (B) Deficiency.